Fresh, tart gooseberries, sweet elderflower and creamy custard make a great summer dessert. Place the gooseberries in a pan with the elderflower cordial and sugar. Simmer for about 10 minutes until the gooseberries are thoroughly softened. Purée through a sieve (or in a blender if you want to include the crunchy pips) and allow to cool. Make the custard by gently heating the cream and vanilla pod in a saucepan to just under boiling point. Meanwhile, in a medium bowl, mix the egg yolks, sugar and cornflour to a smooth paste. Remove the vanilla pod from the hot cream then reserve to use again. Pour the cream over the paste, whisking all the time. Return the mixture to the pan and cook over a gentle heat, whisking constantly with a balloon whisk. Once the custard has thickened, pour into a bowl to cool. 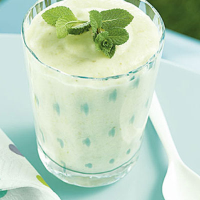 Mix the cooled custard and puréed fruit together and spoon into serving dishes or glasses. Chill in the fridge until ready to serve. Decorate with sprigs of mint. To save time, use a pot of Waitrose Fresh Vanilla Custard and fold in a little whipped double cream to thicken slightly. Seasonal fruits such as strawberries or raspberries, can be used instead of gooseberries. To match the tart-sweet balance of this pudding, try a deliciously fresh and peachy sweet wine.